The Oregon Department of Motor Vehicles is a sub-branch of the Oregon Department of Transportation. It serves various functions related to legal and official matters concerning motor vehicles. To begin an Oregon License Plate Lookup fill out the form above. The Oregon Department of Motor Vehicles manages the titling, registration, ownership, and safety of motor vehicles. It is also concerned with maintaining a record of all vehicle license plates. This includes not only keeping tabs on historical license plates or formulating a license plates manual, it also entails updating the public of any changes to the Oregon license plating system. The department does not reveal certain personal information of any license plate holder or vehicle owner. Only qualifying entities are allowed to access any private information upon request. These entities are mostly agencies or businesses including attorneys, insurance companies, or law enforcement agencies. Apart from these, the general public is not informed about the name, address, or phone number of the license plate holder. Their driver license, identification, or permit number is also not revealed. This respect for privacy is due to the Oregon Record Privacy Law followed by the department. Due to subjection of Oregon’s Record Privacy Law, only a few entities have access to information regarding license plates and vehicle registration. However, there is formal process to be granted this access. This requires them to have a DMV Record Inquiry Account. This account is established by filing an application which would ascertain whether one is qualified to receive personal information or not. A $70 non-refundable charge is also applicable. After payment of this amount, the application would need to be submitted at Oregon DMV along with a proper and complete set of required documents. I looked up the Oregon license plate number in our database and couldn’t find any information about your vehicle history. We can only run complete Oregon license plate numbers so if it’s incomplete our resources won’t be able to track down the information you’ve requested. If you have a VIN number we can also lookup the vehicle history with a VIN search. That being said you can check with the Oregon DMV and see if they can assist you further. I have included a link to their website below. 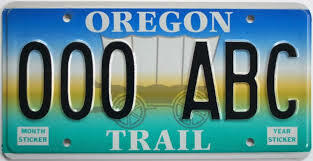 Our Oregon license plate lookup resources are for cars, trucks and motorcycles only. Unfortunately we don’t have license plate resources for trailers and campers. You will want to contact the Oregon Department of Transportation for more information about the Oregon trailer registration including year, make and model. My 1985 Blazer plate number 895KEV was stolen and towed and impounded. My Oregon State taxes were seized to pay impound and storage. The auto was stolen. How do I get my taxes returned to me?